game to erase a two-goal deficit defeating the Energy 3-2. 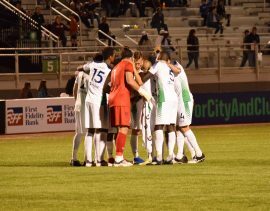 Energy FC gathering themselves before the start of the second half. Pioneer photo by Jenna Lowrance. The result was especially disappointing for the Energy as they controlled the proceedings for the first hour of the game. Oklahoma City played their best half of the season in the first half, where they led 2-0 at the break. “A week ago, we’re celebrating coming back from a deficit and scoring three goals and tonight we’re on the other end of it. I think all of us, coaches and players, understand that can happen. We have to make sure that we play with more intelligence and we make sure that doesn’t happen,” said Energy head coach Steve Cooke after the game. convert any of those opportunities into goals. 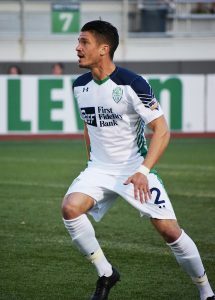 Energy defender Mike da Fonte scored the opening goal on his home debut. Pioneer photo by Jenna Lowrance. cross into the back of the net. 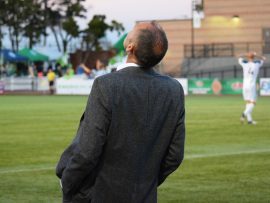 Energy head coach Steve Cooke reacts to a missed shot. Pioneer photo by Jenna Lowrance. striking the ball well high of the goal. forward Brayan Hurtado fired the ball past the advancing Laurendi. beat Laurendi nine minutes later. perfectly in the back corner of the net. when they travel to South Texas to face Rio Grande Valley FC.